These stunning floral arrangements were created by Square Root Designs for a wedding at the Ritz Carlton Laguna Niguel. 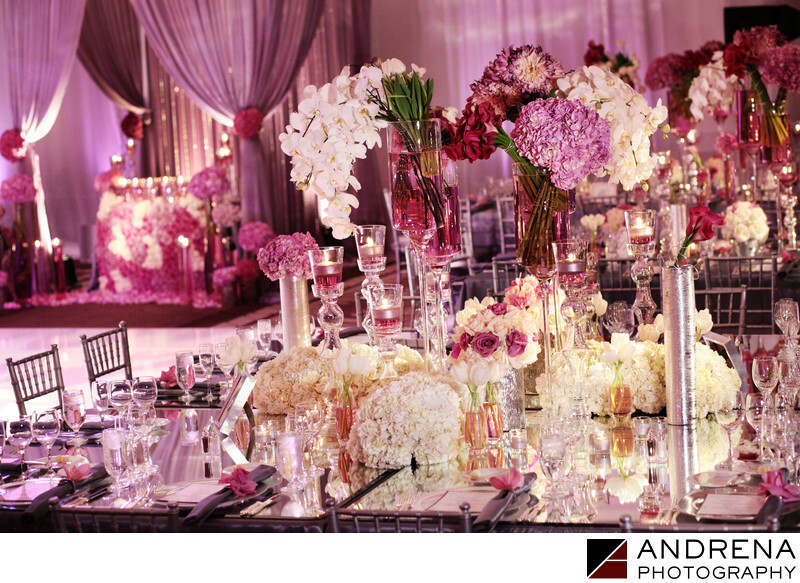 The use of mirrored tables enhanced the decor by providing reflections that seemed to double the visual explosion of flowers. Florals in purples, lavenders and creams were complemented by silver vases and details, which added even more sparkle and pop to the mirrored reflections. The entire room was draped in white with lavender uplighting, and the overall effect was stunning to behold. This wedding was published in Ceremony Magazine. Wedding reception photographed at the Ritz Carlton in Laguna Niguel, California.